The goal of all candidates is to get voters to look at what’s ahead — both in terms of the city’s challenges and what they believe they will do about those challenges. What they were doing before they were candidates, well, that can be problemmatic. Maybe their legislative career had some misses they would rather forget. Plus, it’s hard to run on a record of what you did for your district when you are seeking support city-wide. The fact is, the bulk of any supervisor’s work deal with specific district issues, whether it is a zoning variance or the grant for a group providing services in the district. That’s a good thing, both because district elections are supposed to create a stronger relationship between City Hall and the neighborhoods (something that didn’t happen for all neighborhoods under citywide elections), and because it educates officeholders into the nitty gritty of how government delivers on its commitment. Still: not real campaign flier material. Taken in total, it does tell you a few things, like whether they got things done, and where they were willing to take risks with colleagues because of the values that are important to them. That was particularly true during the Newsom era, because Newsom was unreliable on his own values and even his alliances. For example, he returned unsigned Supervisor Dufty’s measure to help the LGBT Center with a much-needed loan at a time of financial instability. Returning it unsigned signaled that Newsom was unwilling to find a way forward even for someone who was such a strong supporter such as Dufty. Newsom vetoed several bills authored by Supervisor Avalos although they had passed muster with his colleague. With eight votes needed to override a veto, Avalos’s measures did not become law. The fact that Avalos was willing to push forward on issues important to him because of his values tells you something about Avalos as mayor. His record also shows a greater understanding of the city budget than any of his colleagues. Dufty had to operate behind the eight-ball much of the time. He didn’t chair any significant committees, and he didn’t stake any major policy issues as his own. He was a district supervisor concerned with things like overhead utility lines, granting authority for a farmers’ market in his district, and permitting more restaurants in the core Castro and Noe Valley areas. Alioto-Pier didn’t get much love at the Board from her colleagues, and her record shows it. CitiReport reviewed the records of what these four – Alioto-Pier, Avalos, Chiu and Dufty – sponsored as legislators. We chose the list of sponsored measures as an indicator of where the priorities were because they typically represent more staff time, more negotiations with colleagues and more outreach to other city agencies and interest groups. Of course, supervisors do add their names as sponsors at times when legislation is moving through the Board process. As a rule, however, it’s an indicator that a supervisor actually was the lead on a bill if they committee record shows that they or their staff member spoke about the legislation at this early stage. Voting records offer a different yardstick. They are valuable in assessing stances on revenue options, economic incentives, city services and quality of life, and policy questions. CitiReport’s approach using sponsorship is admittedly imperfect, but we think you’ll find enough meat in it to see a little deeper into the record of these candidates who serve or recently served on the Board of Supervisors. In coming weeks, we’ll look as well at candidates whose hold other offices. One thing does stand out clearly for all four: district elections made a difference. Each of the supervisors put their emphasis largely toward funding or other actions that were specific to the district they represented. For those who claim that district elections has failed, they will not find much ammunition here. All five have a credible record of success. Chiu likely leads because, as Board President, typically most departmental requests are channeled through his office. Chiu also introduced more legislation to open up City Hall to non-English speaking residents and to greater participation in general. Avalos, who served as Budget Chair for part of this period, carried legislation that reflected a deep knowledge of the intracacies of city finance, including how the money was being spent. Board President Chiu passed more of his introduced measures than the others, with a 92.7% pass rate on 55 measures introduced during the 30 months we examined. Former Supervisor Michela Alioto-Pier stood at 76.1% out of 35 measures over a 24 month period. Former Supervisor Bevan Dufty stood at 73.1% out of 26 measures over a 24 month period. Alioto-Pier had more measures either killed or stopped short of a vote than any of the other candidates – 11 times, about once every 60 days. To see why the others succeeded or failed, you have to look more closely at what they introduced. 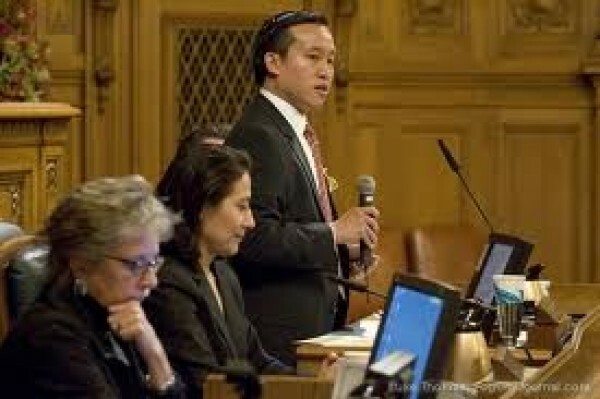 Previous post: Ed Lee: Freight Train or Train Wreck?